Work on heavy SPGs in the Soviet Union began in the early 1930s. By the end of the decade, development stopped, but began anew in early 1940. The Red Army needed tanks to destroy enemy pillboxes. The result of this requirement was the 212 SPG which, for various reasons, was never built. In April of 1942, the 212 project was finally closed, giving way to another no less interesting project: the KV-7 assault tank. November of 1941 was a difficult time for the Soviet Union. The Germans were pushing to Moscow, only tens of kilometers away. Battles were fought on the approach to Tula. Rostov-on-the-Don was lost. 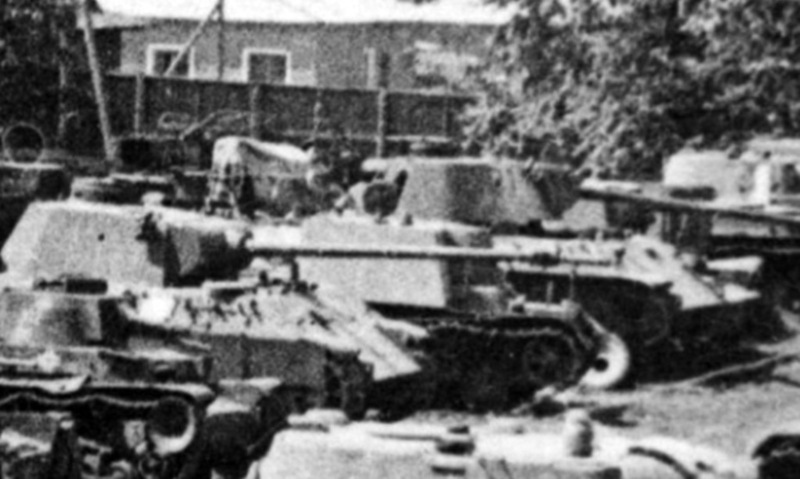 Factories evacuated to the east were just beginning to produce tanks. The Chelyanbinsk Tractor Factory, renamed ChKZ (Chelabinsk Kirov Factory), became the only factory to produce heavy KV tanks. Tankograd first managed to ship over 100 tanks this month, as its numbers were boosted by workers and engineers evacuated from Leningrad. 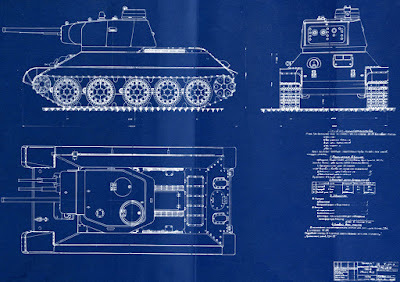 "On Iosif Vissarionovich Stalin's orders, the Kirov factory is developing a mount for a KV tank with 1 F-34 gun and 2 45 mm guns (barrels without recoil mechanisms), with recoil mechanisms for the triplex taken from the ZiS-5. There is no 360 degree traverse, the traverse is +/- 7.5 degrees or +/- 15 degrees, depends on how the ammunition racks are placed. Ammunition capacity: 300 rounds (100 per gun), in addition to which there are 3-4 machineguns. In December, 1/5 KV tanks are to be equipped with these triplexes." It could be imagined that the factory namedropped Stalin as a cover, but this is not the case. The fact that Stalin was the initiator of this project is mentioned in many documents. In addition, the GKO decree that relates to the KV-7 is written in Stalin's trademark pencil. The KV-7 appeared because of many complaints from the front asking for improving the power of tank weapons against unarmoured targets, including light field fortifications. In theory, the triplex could fire each gun individually, or all three in a volley. The KV-7 was not the only project of this type. At the same time, in November-December 1941, a similar project was designed by factory #183, evacuated to Nizhniy Tagil. The tank, indexed T-34-3, was developed under A.A. Morozov. It consisted of a T-34 whose turret also had two 45 mm guns in addition to the F-34. The crew increased to 5 men, and the commander was freed from gunner duties. There is no information on who was the initiator of this project, but it's possible that it was the same person that ordered the KV-7. 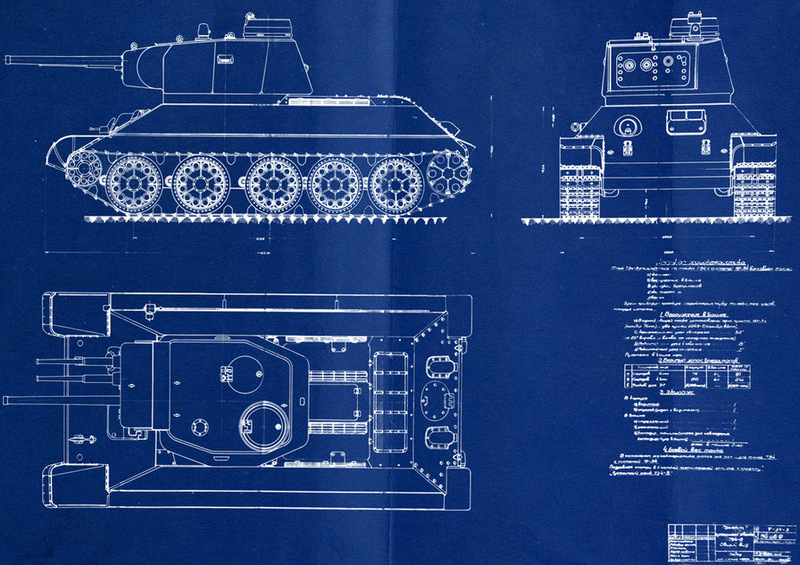 The T-34-3 technical project and design documentation were completed, but a prototype was never built. T-34-3, an attempt to make a medium "volley" tank with a rotating turret. The situation with the KV-7 was different, and the project was very different from what was proposed at Nizhniy Tagil. As with the "bunker buster" from the Urals, work was split between ChKZ and UZTM. SKB-2 in Chelyabinsk designed the chassis, supervised by G.N. Moskvin. OKB-3 at UZTM designed the weapons. 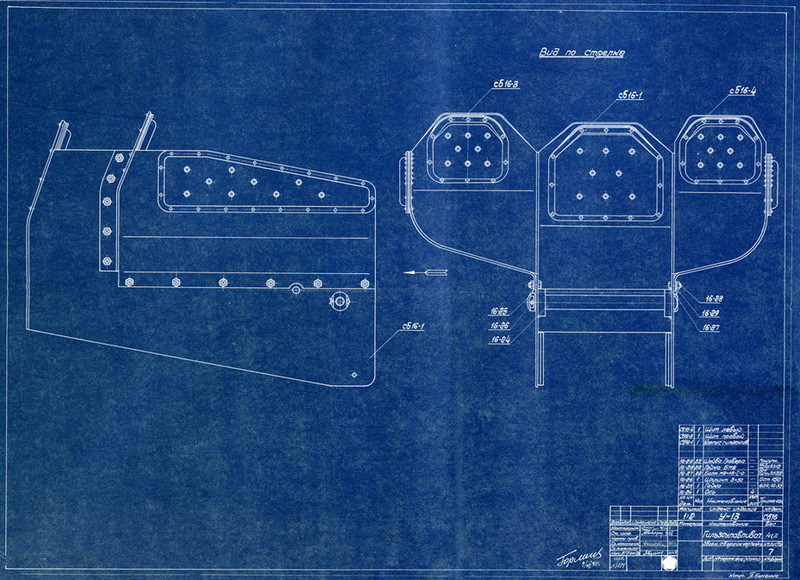 Work on the gun system, developed by engineers N.N. Efimov and K.N. Ilyin began in November of 1941 and finished on December 10th. F.F. Petrov was the chief designer of this system, indexed U-13. A significant part was played by L.I. Gorlitskiy, who arrived from Leningrad and became the chief of the artillery design bureau at the Kirov factory. U-13 gun system used on the KV-7. 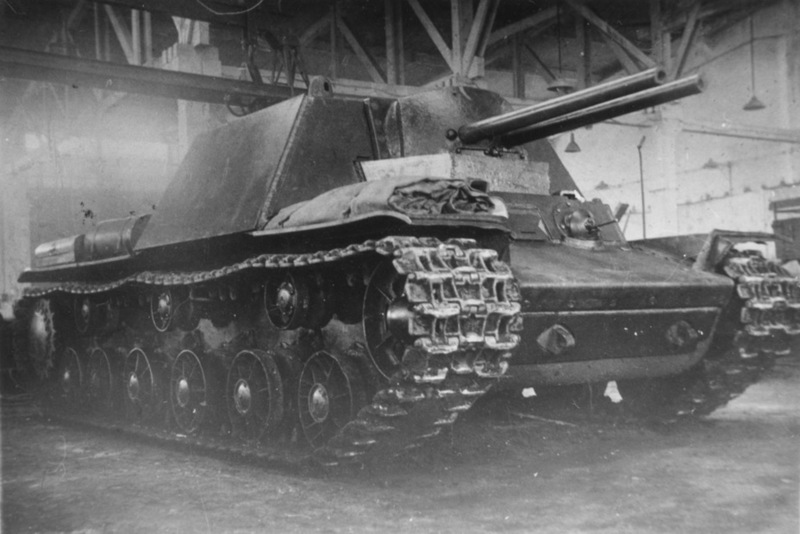 Unlike the T-34-3, the KV-7 had no turret, as it was decided that the U-13 took up too much space. The turret and fighting compartment ceiling were replaced with a casemate. However, the word "casemate" was never used by the designers, who preferred the term "immobile turret". The casemate took a prismatic shape to improve crew conditions, the lower part of it spreading out to completely cover the fenders. As many parts from the KV-1 as possible were used during the design, including the rear machinegun mount, hatches, and observation devices. 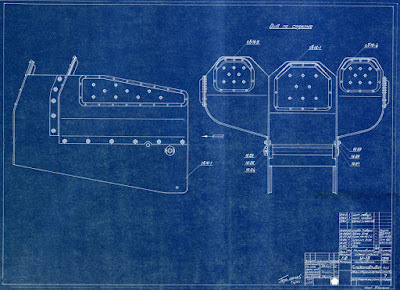 Blueprints of the U-13 brass catcher, dated December 10th, 1941. It's worth mentioning that the KV-7 was not referred to as an SPG in period documents. It was only called "KV-7 tank" or "assault tank". Nevertheless, it had all the features of an SPG. The KV-7 became the first SPG to be developed in the Urals that reached the prototype stage. According to factory documentation, repair tank #5161 built in September of 1941 was used for the prototype. The vehicle received a new casemate and armament, and some suspension elements were changed. ChKZ treated the KV-7 project very seriously. The mention of every fifth tank was no joke. In parallel with production of the experimental prototype, factory #200 prepared for mass production of hulls. On December 30th, 1941, the chief engineer of factory #200, L.I. Eiranov, signed the technical requirements for a pilot batch of 20 hulls. It is not known how many hulls were really produced, but based on further developments, it is likely that the pilot batch was assembled. 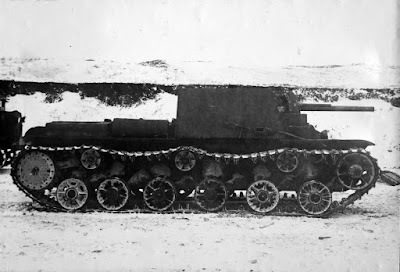 KV-7 at factory trials, late Decembet 1941. On December 27th, 1941 (10 days late), the KV-7 finally completed trials. Due to the hurry, no sight was ready, but there were some more serious complaints. 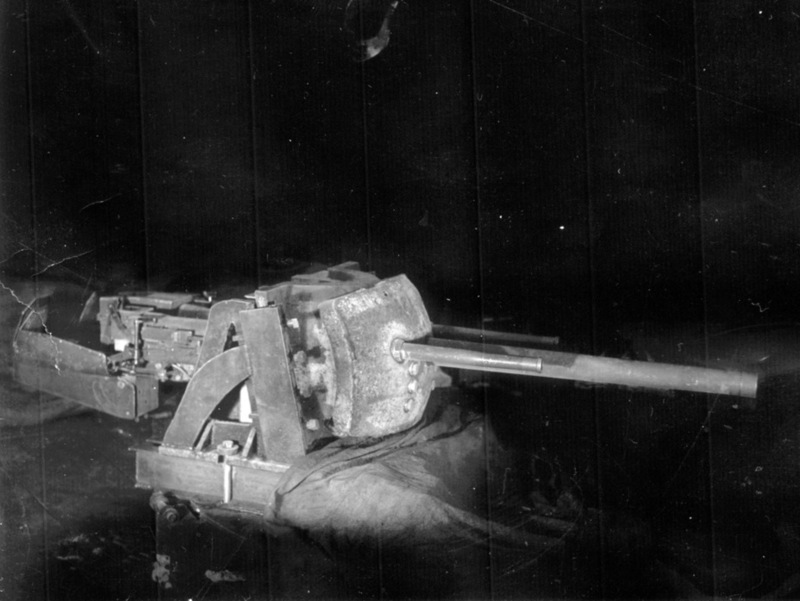 According to the report, the screw type two-ball turning mechanism was poorly designed and led to high dispersion during firing. Captain P.F. Solomonov, the supervisor sent by GAU, made a list of over 10 defects that needed to be corrected. However, there was no time to fix most of them: the tank was awaited in Moscow on January 5th. On the scheduled day, trials were performed at factory #8 in Mytishchi. The vehicle was also inspected by a commission from GABTU, GAU, NKV, as well as Voroshilov and Kotin. When shooting from standstill, the gunner managed to fire all three guns at once on the third attempt, and the precision at 400 meters ended up being quite low. Trials showed that the rate of fire was 20-24 RPM. Individually, the guns fired about as quickly as they did in regular tanks, which cast doubt on the idea of volley fire. The F-34 could fire 3 rounds every 34 seconds, but the 45 mm guns could fire 5 times. The rate of fire was deemed unsatisfactory by the commission. In addition to unsatisfactory precision, especially when firing in a volley, the thickness of the front armour was deemed insufficient. A proposal was made to increase it to 110-120 mm. In addition, it was proposed that the SPG should instead have two 76 mm guns. After receiving the results of the trials, Stalin personally wrote GKO decree #1110ss "On production of KV-7 and KV-8 tanks". The first point read: "cancel the proposed 3-gun KV-7 tank". The KV-7 was not cancelled entirely, but the pilot batch was never produced. On January 27th, 1942, tactical-technical requirements for a tank with two ZiS-5 guns were composed. KV-7 with two ZiS-5 guns, March 1942. As with the first variant of the KV-7, work on dual ZiS-5 guns was assigned to UZTM. L.I. Gorlitskiy directed both projects. The new system, indexed U-14, was also worked on by N.V. Kurin and G.F. Ksunin. 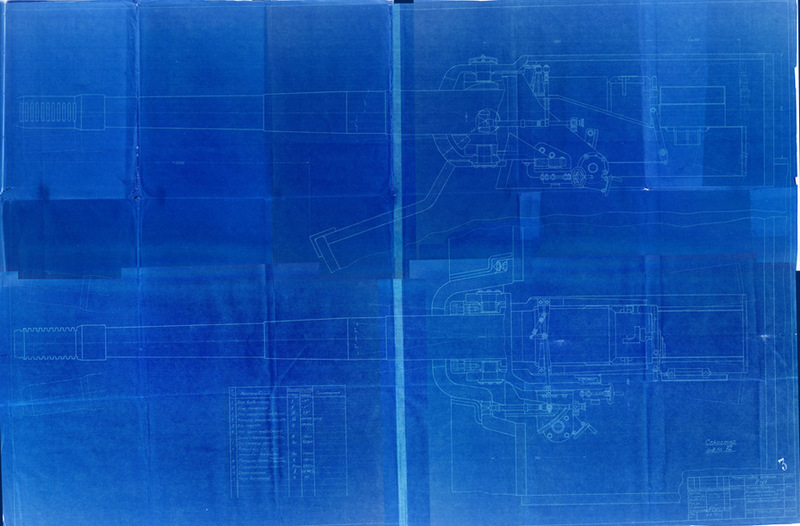 According to dates on various blueprints, work began no later than January 25th, before receiving tactical-technical requirements. Work on the U-14 was finished in mid-February, and work on the modernized KV-7 began in the second half. The new tank wasn't built from scratch, the old KV-7 with the U-13 was used. Only the gun mantlet and ammunition racks were changed. This is how the KV-7 sent to trials would have looked like. 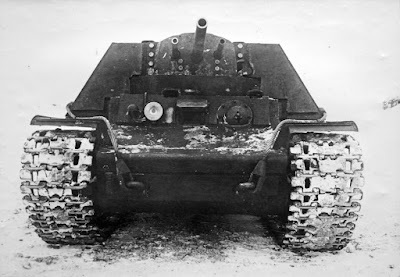 The trials of the new KV-7 were planned for March 7th, 1942, consisting of 400 shots and a 50 kilometer drive. In reality, everything happened differently. Since ChTZ was very busy and the priority of the KV-7 was reduced, the tank only began trials on May 14th. A rate of fire of 6-7 RPM was reached, but the system was unbalanced, which resulted in the sights shifting with each shot. The ammunition rack was deemed inconvenient and the turning mechanism had to be operated with both hands. The trials ended and interest in the KV-7 waned. The KV-7 resurfaced in October of 1942. During P.F. Solomonov's trip (now as a Major) to the Kirov factory, he inspected experimental SPGs. Mobility trials were also held. In November, GAU proposed that the tank should have a commander's cupola installed, all systems should be tuned, and it should be sent to military trials. The idea was binned, but the KV-7 managed to serve Soviet tank production. A planetary transmission developed at the Baumann Institute in Moscow under the direction of G.I. Zaichik. After that, the KV-7 ended up in storage at factory #100 and in December of 1943, the KV-7, along with the KV-9 and KV-12 were scrapped. Last photo of the KV-7, made in the fall of 1943 in the storage area of factory #100 storage. In early January of 1942, GABTU started discussing the idea of installing something more powerful than a 76 mm gun into the KV-7. The initial proposal was the 152 mm M-10 howitzer. In late January, S.A. Ginzburg prepared the requirements for a 152 mm howitzer on the KV-7 chassis. In the plan of work for 1942 approved by the People's Commissar of Tank Production Malyshev, this vehicle is listed at #59. According to the plan, Kirov factory was responsible for the chassis and UZTM was responsible for the gun. Blueprints were due on March 15th, an experimental prototype by May 1st, and mass production blueprints by May 10th. 300,000 roubles were issued for this project. This was not a lot of money compared to, say, the 212 project, but this was not a vehicle built from scratch, only the conversion of existing KV-7 hulls. GAU had a mixed reaction to this new project, since the artillerymen still wanted a Br-2 gun on a KV-3 chassis. An artillery system on the KV-7 chassis seemed lacking. However, they soon had to shrink their appetites, as it became clear by early April that there won't be a bunker buster with a Br-2. Assign the work to Kirov factory in cooperation with factory #221. Since the creation of a chassis for this project is difficult, consider it acceptable for the moment to settle for a design of this SPG. Temporarily accept the installation of a 152 mm mod. 1937 gun-howitzer into a KV-7 hull. Assign this work to the Kirov factory." Soon, instead of factory #172, UZTM was assigned work on the gun. Cooperation between ChKZ and Uralmash on the KV-7 project continued. The project, developed at Sverdlovsk since early 1942, was finally indexed U-18. As with the U-13 and U-14, L.I. Gorlitskiy directed the installation of the ML-20 into the KV-7. Reconstruction of the overall view of the U-18. "The KV-7 is most suitable as the chassis for this SPG. Dozens of hulls and turrets for this tank are present at the Kirov factory in Chelyabinsk, designed for one 76.2 mm and two 45 mm guns." It would appear that this approach by the UZTM design bureau was perfect for using up these hulls, but that just makes the ending to this story that much more surprising. On September 24th, 1942, the chief engineer of UZTM, M.G. Umnyagin, received a letter from the chief of the 6th department of the GABTU BTU, Engineer-Colonel Kovalev. "In response to your letter #3655/48s about the U-18 SPG, an analogous project was proposed by comrade Petrov on September 12th and was discussed by the Technical Committee of the Commissariat of Armament." Suddenly, the story of the U-18 was over before it even began. The U-18 and U-19 SPGs designed under Gorlitskiy's direction remained on paper and sank so deep into the archives that they were completely forgotten. Only their indices remained, which, due to a lack of information, were erroneously assigned to projects developed at factory #8 under F.F. Petrov. Each of them is worth their own story. In the picture from factory #100's storage area, what tank is that immediately behind the KV-7? It looks like an A-43 with a rear-mounted turret (or its turret displaced rearwards from the turret ring quite a ways). It's a Panther with the turret turned, I think. You can make out the characteristic rear hatch. Ah, now I see it, thanks! I was wondering what that was. I notice now that it's much too tall and the glacis too sloped to be an A-43 (among many other details that make it unlikely to be one). 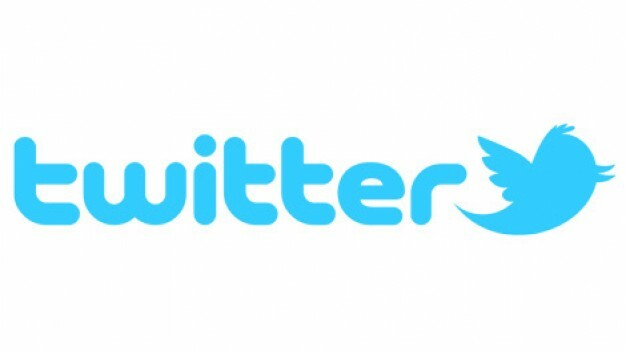 A very nice initiative you run here. Tanks and WW2 archives, opening them to the public. A very humble work indeed!